Welcome to the Fordingbridge Rotary website. Please have a look around to find out what Rotary is all about, and contact us if you wish to. 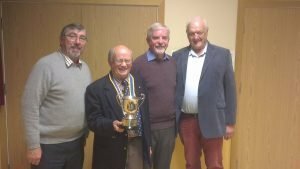 The Fordingbridge Rotary Club has run the Summer Festival for the past nine years and has relinquished the Management of the event. However we are pleased to announce that the Fordingbridge Events Group, set up to bring more “Zest” to the town, are taking up the management of the event. Fordingbridge Rotary continue to be involved and are delighted to be included in the organising committee. The new Festival web site can be found at https://www.fordingbridgefestival.com. Stan Broomfield, Stephen Walker, Iain Savage and Tim Bailey display the silverware after winning the District 1110 Conference Golf Tournament. In December 2014 Fordingbridge Rotary agreed to support Hillcrest Rotary to try to obtain a Rotary Global Grant to provide a Water Harvesting Project at iKhethelo Children’s Village, previously Makaphutu Children’s Village, situated close to Hillcrest, a suburb of Durban, South Africa. In late 2015 the grant was finally approved and the project had the ‘Go ahead’. In 2016, when news was coming through of the work undertaken, Michael Jackson suggested a trip to South Africa to see ‘firsthand’ what had been achieved and Richard Westlake and I agreed to go. I did of course specify that I would have to take my ‘personal hairdresser’ with me. We obviously had to combine this visit with a few days holiday in and around the Durban area to make such a long flight worthwhile. 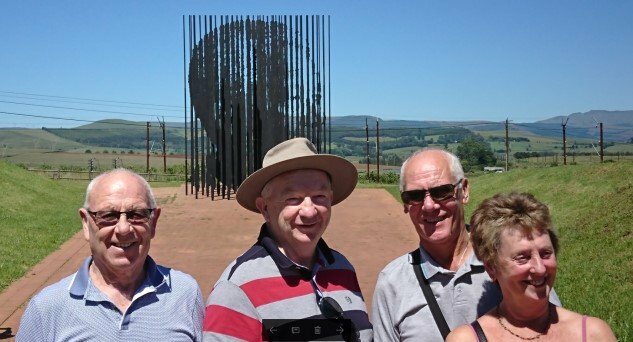 I am therefore providing a ‘day by day’ report of our activities over the thirteen days of our trip of which our thanks go to Dennis Wesley and the other Hillcrest Rotarians for organising. and then through the long night before we arrived in South Africa. 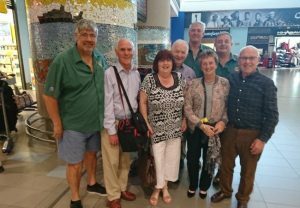 Arrived at Johannesburg and then caught the internal flight to Durban arriving between 10.30 – 11.00 to be met by our Rotarian hosts Dennis Wesley, Rob Campbell, Martin Wheeler and their partners and other Rotarians. The heat hit us as soon as we were out of the terminal. Our party separated at this point and we were taken to our individual host’s homes, Michael Jackson with Dennis Wesley and Sue, Richard Westlake with Martin Wheeler and Cathy, Eileen and I with Rob Campbell and Pat. The remainder of the day was spent with our hosts allowing us to drink a lot of beer and to get use to the heat and to recover from the flight in that order. direction shows his head and facial features. Our next stop was at ‘Nottingham Road’ for refreshments before entering the Loteni Pass which started as tarmac but soon became a gravel/mud track with plenty of ‘pot holes’. Our ‘Quantum’, driven by Dennis Wesley, coped very well but with a very stiff suspension, those of us in the rear felt every pot hole. 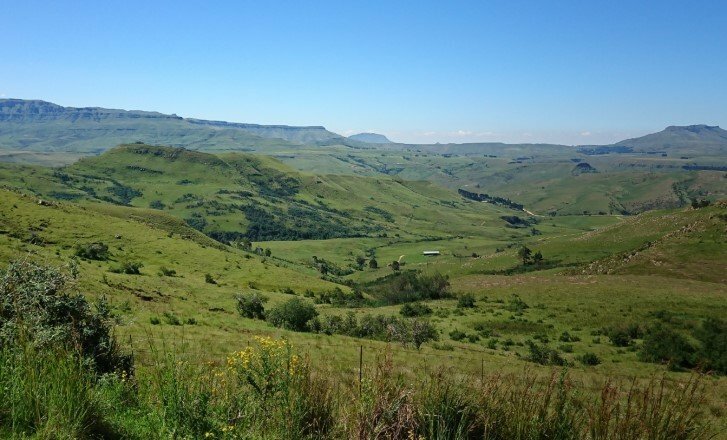 However the scenery which surrounded us was worth the bumps and we had excellent weather to view the glorious mountains of the Drakensburg Park. That evening we attended the Hillcrest Rotary meeting and were welcomed by President Martin Wheeler. Hillcrest thanked us for our support and the meeting allowed us to express our appreciation of the way we were being hosted. 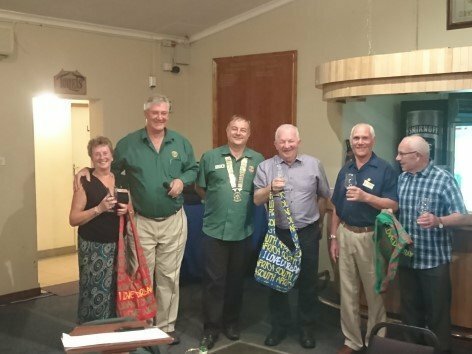 It also allowed the exchange of club banners including the President of Fordingbridge Inner Wheel, Eileen, presenting their banner to Hillcrest club. A new Rotarian of Hillcrest was inducted, Colin Heads, and Colin would be accompanying us over the next two days. We arrived at Underburg where we were staying in a B&B for the next two nights. That evening we went to a ‘Braai’, [barbeque to us], at a Rotarian’s home from another Rotary club. 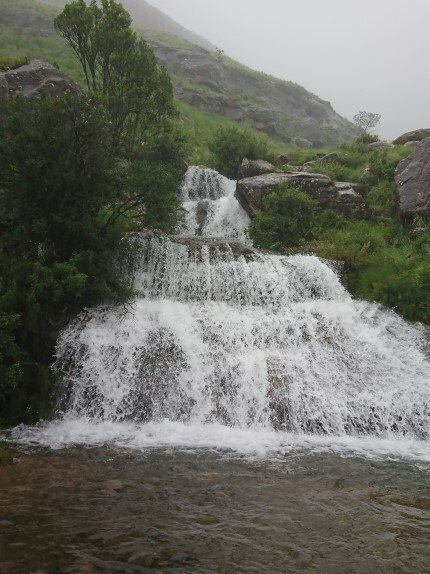 As we arrived we were met by thunder and lighting and the heavens deposited gallons of rain. This actually delayed the lighting of the ‘Braais’, if this is the plural of ‘Braai’, by about an hour or more but eventually we all ate and drank sufficiently. On our way back to the B&B Dennis Wesley thought there was a road check so we had to find another driver. Step forward Richard Westlake who was the only one who was possibly under the drink limit. He did exceptionally well, despite thinking the ‘Quantum was an automatic not a manual. Actually there was no road check, just red lights. The rain was still with us but it had eased slightly. Today’s outing was to the ‘Sani Pass’ climbing by road to the top and entering ‘Lesotto’. It was still raining but we were travelling in a 4/4 Land Rover so we felt quite safe especially as our driver for the day told us his name was ‘Wilson’. I say by road but like the ‘Loteni Pass’ it starts with tarmac but soon becomes gravel/mud. 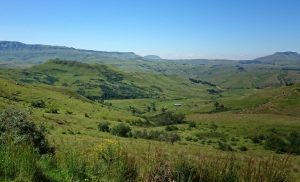 The pass goes up through the Drakensburg Park around the periphery of the mountains so on one side of the track there is a sheer drop. It soon became evident that a lot of water had been deposited the previous night and was still being deposited on the track. We climbed slowly up, at times not sure where the track was, owing to the quantity of water covering the ground. Our driver ‘Wilson’ was tremendous, telling us what we could have seen if the low cloud and rain had not been present. When close to the top he told us we had fourteen Z bends to negotiate before reaching the summit. He said each one had been given a name. As we negotiated one he said it was named ‘OMG’ and Eileen looked out her window and was heard to say ‘Oh My God’. Michael Jackson, who was sitting in the rear row of seats, saw the side of the track disappear just as we were going around it. He did not tell us until we had descended. At the top we were taken over the border into ‘Lesotho’ and visited the local people who live in ‘Mud’ huts. The native lady we visited had baked bread in a little pot which was in the centre of the hut which we all tasted. I think it was possibly the nicest bread I have eaten. We were surprised to find that at the top, when crossing into ‘Lesotho’, there was a very good tarmac road which we were told had been built by the Chinese. We understand this is to gain access to the minerals which exist here. We then returned to the summit to visit ‘The Highest Pub in Africa’ for lunch followed by the descent down the pass. We then returned to Hillcrest to have dinner with all the party together with their hosts at Rob and Pat Campbell’s house. Still raining!. Today we were taken to see the iKethelo Children’s Project. We were given a talk by the Head Tutor of the village who told us that the village caters for 43 children aged from a few months to late teens. All of the children have been orphaned through ‘Aids’. Most of the children attend schools outside the village but some are taught within the village. The academic level of the children differs and some children have to go into classes for children younger than themselves because of their level. 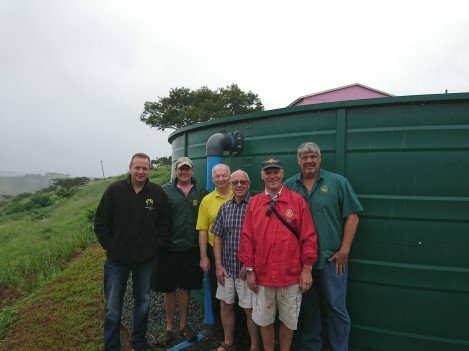 We also met Rotarian Carl Grossman, who is a qualified water engineer who had designed and overseen the construction of the harvesting project. We were shown the layout of the system and he explained the workings and showed us the various pumping stations and storage tanks used. We were impressed with the standard of the project. We were then taken on a tour of the village where houses with four bedrooms and a living/kitchen area cater for eight children, each house having a ‘House Mother’. We visited the internal school and met the tutors and children who were there that day. After this we were taken to see two other projects that the Hillcrest club have achieved. One was a Training Centre where adults learn trades such as seamstress, pottery and welding in order to get employment. The other was specifically for the older generation who were being trained to use sewing machines. the river and the surrounding ‘bush’. There was a large communal lodge which contained an enormous lounge, dining room and kitchen. All these looked over the river and adjoining ‘bush’. We had a Park ranger, chefs and maids to cater for us during our stay. Getting to the lodges was along gravel/mud tracks which the Land Rover easily coped with but unfortunately the ‘Quantum’ got stuck in a pothole. Various attempts failed to remove it until Richard, to the rescue once more, lifted the rear of the vehicle and got the rear wheels to get traction. One has to remember this is in a wild life game park where dangerous animals are free to wander. The rest of the day was getting settled into our lodges, eating dinner, which consisted of steak, chops, chicken legs, bacon, sausages, mushrooms, beans ,fried potatoes and bread and butter, followed by fresh fruit, all supplied and packed by Dennis Wesley and Sue and prepared and cooked by the lady chefs. The evening was spent over drinks in the lounge, putting Rotary and the world to rights. Still raining. 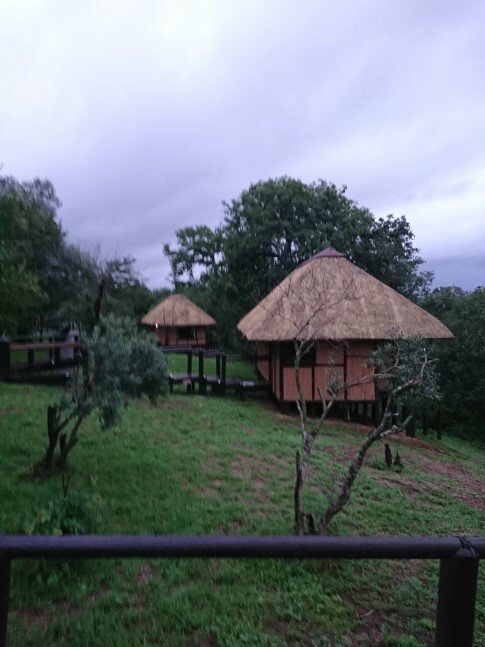 This started with a 6.00 am drive into the park but as the rain was still falling it was thought that the Land Rover should be used so as the start was to be 6.00 am, I volunteered Eileen and I to remain at the lodge to make sure the cooked breakfast was ready for 8.00 am. 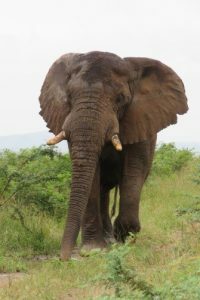 During their drive, despite the rain still failing, they saw a Lion and a Rhino. After breakfast, Colin, with his Land Rover, had to return to Durban on business. The Park warden and Dennis Wesley were concerned about the ‘Quantum’ getting stuck so we decided to stay at the lodge until the afternoon when the warden accompanied us to the park’s main tracks and met us on our return with his vehicle with towrope if needed. 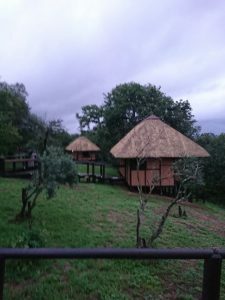 All went well and we saw a large number of wild beasts including, Impala, kudu, Bison, Rhino, Zebra, Monkeys, Baboons, Vultures, Hawks and a Crocodile lazying in the river near our lodges. This was followed by another tremendous dinner with drinks and a pleasant evening in the lounge saving mankind. to Hiuhluwe Park. This was another three hour journey but most of the tracks were now tarmac. This allowed us to see more wild life including Giraffe and a huge male Elephant which came down a track from the ‘bush’ onto our road. He passed directly in front of us and continued down the road and we followed until he stopped at a tree on the near side of the road to have an enjoyable scratch. While he was enjoying this we pulled out around him but he was so close one could have scratched his backside from the window of the vehicle. A marvellous experience. Having lunch on route we headed for the Greater St Lucia Wetland Park where we were to go on a river cruise. Having booked into a B&B for the night we boarded the boat at 4.30 pm and started the trip. 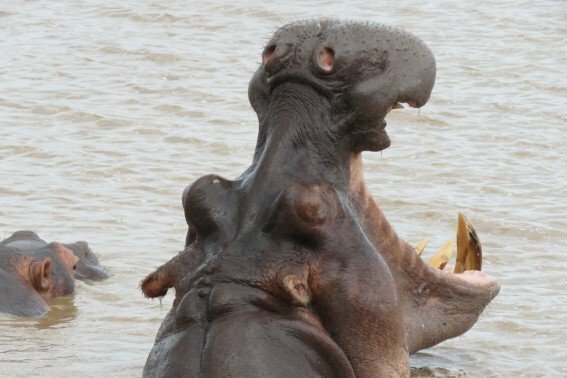 It was not long before we sighted a few Hippopotamus but continued until we were alongside a group of about twenty or more including a very young one. We were informed that they were standing on the river bed not swimming but whilst watching them we saw a group of Crocodiles more in the swamp land at the side of the river. We were informed to take care at night as the Hippopotamus feed at this time and enter the town of St Lucia looking for food. On the return trip we saw many birds including the Giant Kingfisher which was a big as a pigeon. The day was concluded with a superb meal at the Water Ski Club where we had a meal of Hake and Prawns which we all agreed was the best we had tasted. Not raining but overcast. 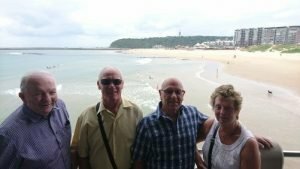 We travelled to Umdloti Beach where we were staying in an few beers and looking out to sea where there were a large number of ships anchored. Many of these were waiting to go into Durban harbour, which we were informed is the largest harbour in South Africa, either to load or unload before sailing away. At night their lights made an attractive back drop. Michael had a swim in the pool with Richard patrolling even though it was a ‘Gated’ complex. Sue and Dennis Wesley had joined us for the afternoon and evening and were staying in accommodation just down the road. The day was concluded with a very pleasant meal at a restaurant opposite the beach. We awoke to see a marvellous sun rise at 5.15 am which bode well for our chance to visit the beach at Umdloti. We had breakfast in a restaurant and then wandered across the road to the beach to enjoy the sea water of the Indian Ocean whilst bathed by the glorious sunshine which was now present. This was most enjoyable. 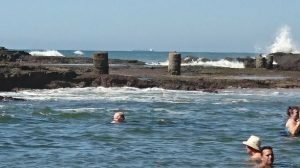 Michael had a swim in a large pool created by a rocky outcast and the rest of us paddled. The only problem which I experienced was the sand under the water was rather like ‘quick sand’. As you stood on it, it just gave way and before long it was above your ankle. At one time I was left ‘ pirouetting’, with my right leg not able to move. However my actions trying to move were noticed and attracted help from Eileen and a very helpful unknown lady who also saw me. 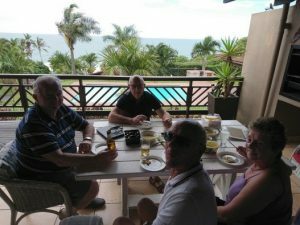 The day was completed with a ‘Potjie’ at the house where Dennis and Sue were staying. This is a meal cooked in a cast iron pot surrounded by charcoal. It took about four hours to cook and was like a stew with Ox Tail as the meat. It was very good. 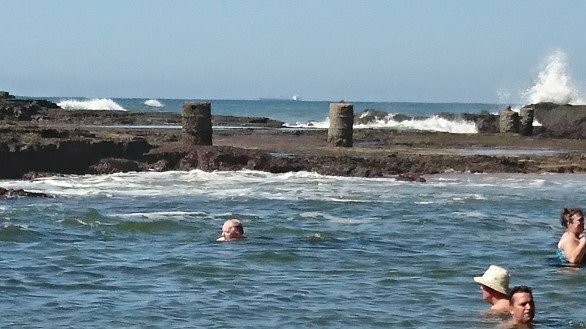 We left Umdloti at 8.00 am to return the ‘Quantum’ back to the hire company at Durban airport after which we had a superb breakfast at a restaurant on the pier and saw some Dolphins in the sea. Then a bit of shopping in the nearby shopping precinct to get the ‘pressies’ for the family. We then return to our host’s residence to pack and prepare for our return to the UK the following day. 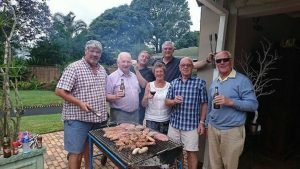 However there was one more social gathering to go to which was an enormous ‘Braai’ lunch at Dennis Wesley and Sue’s home to which a number of Hillcrest Rotarians came along to say goodbye. After breakfast with our host and the final bit of packing, at 1.00pm we left with our hosts to go to Durban airport where we checked in for the flight to Johannesburg before having lunch at the ‘Mug and Bean’ at the airport. We said our good-byes to our hosts and then through to the departure area. 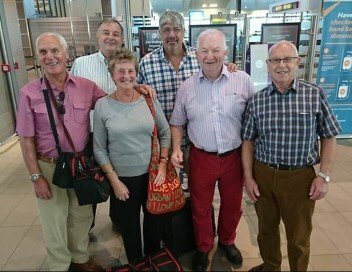 We arrived ok at Johannesburg and checked in for the flight to Hearthrow which arrived back at 7.10 am on Tuesday 28 th February and back to Fordingbridge at 8.30 am. I must say how glad Eileen and I feel in deciding to visit ikethelo Children’s Village and to see firsthand the benefits that Fordingbridge Rotary club’s support for this project has provided. It makes one feel that the effort made to complete the application for a Global Grant was all worthwhile. As a final aside, during the trip, arrangements had been made for ‘Assisted Travel’ for Eileen, who could not have walked the distances involved at the airports owing to her recent spinal operation and now knee problems. This was such a superb service in getting through immigration, customs, departure gates and boarding aircraft that both Michael and Richard want Eileen to travel with them on all future trips. As we all know I have somewhat sloping shoulders when it comes to the more nitty gritty aspects of Rotary and when Mike asked for a volunteer to report back on our trip I was very happy to accept Dennis’s offer. Thank you Dennis for the very detailed and accurate report; it enables me to make some sense of the jumbled blur of my own recollections. However I do not have to think too hard to make the following observations. Seriously though Hillcrest (not unlike Fordingbridge) have a few very talented members who have the ability to stretch the money at their disposal and give incredible value for money. 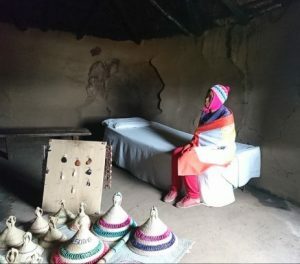 However they desperately need funds to develop an exit strategy as government money stops as soon as the children in the iKhethelo Children’s Home reach 18 years of age when they could well suddenly find themselves without a home and without a job. Not to continue the support until they become self-sufficient would be a tragedy. Undertaking to provide some sort of scholarship/bursary to help this process would be a good use of our funds. Furthermore with an exchange rate of 16 Rand to the £ our money goes a long way! Rotary is not about politics or religion, but that doesn’t mean we can’t discuss current affairs. 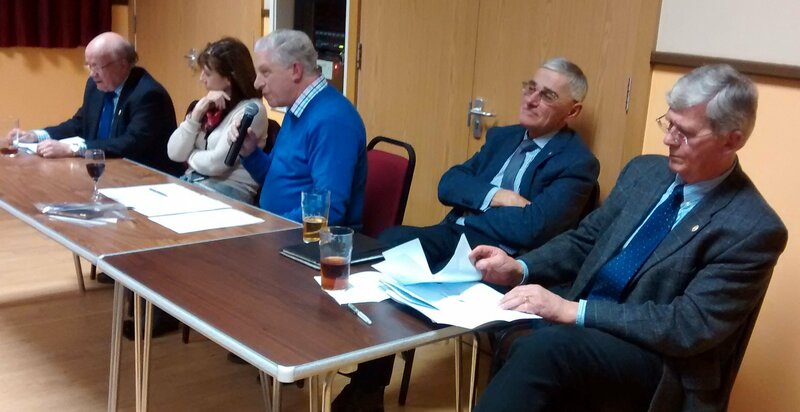 Yesterday’s meeting featured a ‘Question Time’ panel, chaired by David ‘Dimbleby’ Hales, and starring Stephen Walker, Toni Butler, Martin Calver, and Paul Hammond. Questions from members had been given to the panel before-hand to give them a chance to do some research, and there was time for general discussion on each topic. Should girls under 18 be encouraged to play rugby, football, and cricket? And if over 18 to carry rifles in war? Should Britain get rid of all diesel-engined cars? Should we ban the wearing of the burka or other forms of veil or hood in public? Should parents and schools limit the amount of use by children of social media? Donald Trump thinks global warming is a myth. What does the panel think? What is the panel’s opinion on the alleged cyber-attack by Russia on the US electoral system? Welcome to the Rotary Club of Fordingbridge website. See the Location page for more details. Members: click on 'Log In' in the menu to see the members' pages.